My human sister tried to take pictures on our walk on Saturday. As woo can see, I was a great model. I never look directly at the camera. It apparently drives my humans crazy, and I don't know why. Sometimes I pretend to look at it...then quickly turn my head away! Tricked ya! By pretending as if woo are going to look at the camera, woo keep the humans on their paws. I am such a good model. P.S. Did woo hear? We might get more snow tomorrow! Hopefully I'll be back with snow pictures! Cross woor paws! First of all, the Snow Thief took much of my snow bewootiful snow today. Second, my human sister woke me up super early at 1:30 PM and took me to the V-E-T to get my leg checked out. No ouchy pokey thingies today, though. But the V-E-T kept pulling, pushing, and pressing on my leg. He told me to cry if anything hurt really bad, but I was a big boy and I didn't cry at all. I think the V-E-T called it a possible muscle strain from playing too much in the snow. He told me to rest for 5-7 days...as if! He gave me some medications to take if my leg hurt too much though. Hopefully I won't need to take anything for my owwie to go away on its own. Hope woo are all doing well! Sorry I haven't posted anything in such a long time. My humans have been quite busy lately. I hope many of woo got lots of snow from Winter Storm Pax! I have no idea why his name is so long or why I never saw him around, especially since he stayed around long enough to drop off so much snow. If any of woo see him, please tell him thanks for all the snow. Here are some pictures my humans took of me over the weekend. Look at all the white fluffy snow! Then I ate some of it to see how a snow angel tasted. I wanted to feel the difference between rolling on grass and rolling on 12" of snow. Then ate some more of my snow angel. Well, I must say, my snow angel tasted pretty good! Although I enjoyed playing in all the snow, my humans are concerned because I started limping my front left leg on Thursday night. Sometimes it feels ok, but sometimes it hurts really bad. I'm not sure what's wrong either. I overheard my humans saying something about making me rest for a couple days to see if it heals on its own, but I'm a husky! I don't sit still for very long. My humans plan on watching me closely for a couple more days, and if it does not improve, they might take me to the V.E.T. Please let it be just a sore muscle! I've been super itchy for about a week now, and my humans think they've found the culprit: salmon oil. Woo may ask, how can a husky, of all dog breeds, be allergic to salmon oil? I was eating salmon oil around this time last year when I got super itchy and had to get my head shaved TWICE. It could be due to the environment, and we are definitely not ruling that out, but my itchiness was significantly decreased during the time I was not eating salmon oil. I have been on sardine-anchovy oil since October/November of last year, and we just switched to salmon oil a little more than a week ago. I became super duper itchy all of a sudden, and my humans say it is a good chance that I'm allergic. Well, I'm sad that I can't eat any more yummy salmon oil, but I'd rather be not itchy! My human sister and brother took me to the V-E-T last Friday! They woke me up super duper early at 10:15 AM. I thought we were going somewhere fun, like a play date or to the doggy beach, but nnnnoooo. 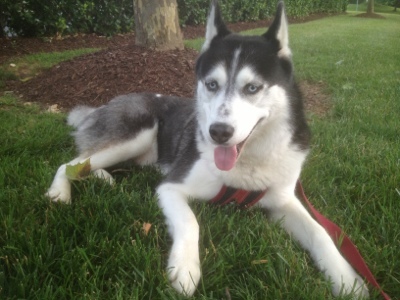 My V-E-T is Dr. Pema Mallu at Veterinary Holistic Care in Bethesda, MD. She and her assistants are super nice, but I woo'ed the WHOLE time because I was still not happy being there! First, they put me on the scale. I now weigh 46.6 pounds, which is down from the 49.8 lbs I weighed last year, but it's too hot these days for me to eat much. Then the humans took me into a room where I tried to hide from Dr. Pema under my human's chair, but they found me. The humans pulled me out and Dr. Pema kept TOUCHING me! And she used these special toys to look in my ears and eyes, but she didn't let me play with them. She said I have a little bit of something called cat-a-rackts, whatever that is. Maybe it's a new type of cat? But why would it be in my eyes? Then Dr. Pema poked something into my front leg and it was really owwie, but I was a big boy and didn't cry. It's best not to watch the V-E-T draw the red liquid from woo. Dr. Pema said it was for a "hart-worm" test and a "Distempter/Parvo" titer. I don't know what those are, but the humans seemed to think it was important. We're still waiting for the "hart-worm" and the titer test results, but Dr. Pema said everything else was good. Hope woor weekend was better than mine! We are lost for words at the news of Thunder's passing. I was introduced to the OP Pack blog in 2010, and I am so glad I had the pleasure of getting to know Thunder a little bit through the blog. During times like this, we ask ourselves, "Why? Why so suddenly?" Indeed, the news of Thunder's illness came very quickly, but my bi-peds and I are also thankful that TD had such great family members and vets, so he didn't have to suffer for very long. I believe that we each have a reason for being on Earth, and that when we have accomplished our goals or fulfilled our reasons for being here, we are called back to that special place named the Rainbow Bridge to wait for our humans and friends. Although we miss him greatly and still feel that Thunder was taken much too soon, I am happy knowing that he is whole and pain-free again. He is gone physically, but we know he'll be watching over us every day. Wear your silver harness proudly, Thunder! Until we meet again, buddy. 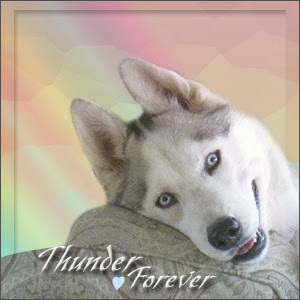 Please leave words of support for Thunder's family here. It's been just a little over a year, but when my human and I returned to the same park where we were followed by deer #1, we were confronted by a deer #2! I'm not very good at telling deer apart, so I don't know if Deer #1 is Deer #2. This time, we weren't chased, but Deer #2 crossed the trail right in front of us. Can woo see the deer from this far? Staring contest with Deer #2. Unfortunately, my human did not want to see who won the staring contest (I'm pretty sure I won, though). Until we meet next time, Deer #2!! We are very sad to hear that Thunder at the OP Pack isn't feeling so well. 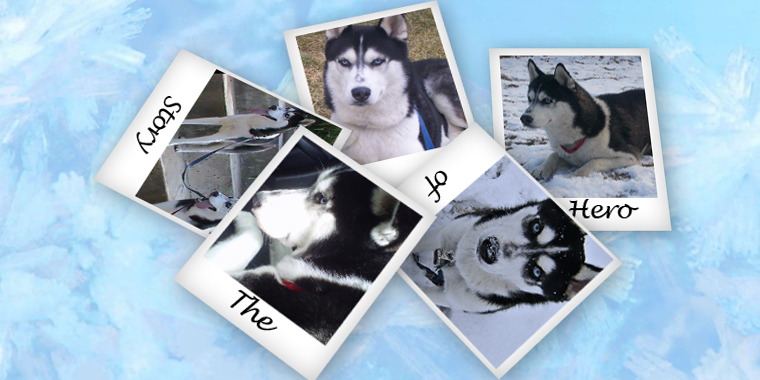 So far, his prognosis isn't very good, but we know that the Power of Paws is stronger than any medicine from the V-E-T. Please continue praying and crossing woor paws that TD will feel better soon. Check Out My Favorite Doggy Blogs! Ramsey and Pablo Have Moved! Coats and Vests for Dogs! Rain, cold, safety.